When the 5th Generation Camaro went on sale in 2010 it changed perceptions of what an American muscle car could become. The Zeta platform Camaro combined sublime handling with a quality interior and exterior styling so aggressive Michael Bay cast the new Camaro as Bumble Bee in Transformers. GM offered up plenty of trim levels and a range of power options including the venerable LS3 and L99 engines. While The Camaro’s l99 and LS3 engines already produce quite a bit of power (400HP and 426HP respectively) there is still plenty of headroom to make some real tire shredding numbers. SLP’s supercharger kits are the best power adding option available to Camaro owners, and here’s why. SLP’s 2010-2014 Camaro V8 Supercharger Kit is a complete package designed for both the L99 and LS3 engines. Included items in the kit are: SLP designed high-flow clean air induction tube and bellows; a complete and organized plug and play Wiring harness; a 2 BAR map sensor; fuel rails; Belts; a new high tension belt tensioner that eliminates thrown belts; SLP supercharger assembly; and all of the fasteners, hardware and pre-cut, pre bent hoses needed for a painless installation. Also included in the kit is a handheld touchscreen PCM calibrator with pre-calibrated tunes designed to maximize gains from SLP’s Supercharger Kit. Each part has been painstakingly engineered or carefully selected by SLP to highest quality and performance possible. OEM measurements for factory level clearance and mounting, an organized and complete parts list and detailed step by step instructions makes it possible to install this kit painlessly in just 8 to 10 hours. The result is an engine that looks as though it were supercharged straight from the factory. Expect Horsepower gains up to 35% for LS3 and 37.5% for L99 engines. 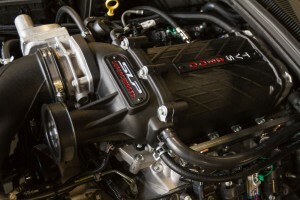 That’s an increase of 150HP, for a total of 575 HP for the LS3 and 550 HP for the L99! 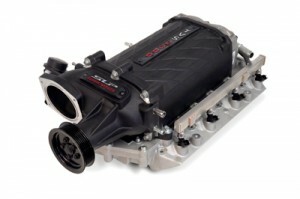 The SLP TVS2300 has been engineered from the ground up to provide the best possible performance for Zeta V8 Camaros. Eaton TVS technology rotating assembly features four-lobe direct-drive rotors twisted at 160 degrees and improved inlet and outlet ports that enhance thermal efficiency. The Direct drive design requires no jackshaft, extra bearings pulleys or belts. The outer casing features a distinctive helix design, unique to SLP superchargers, indicating the TVS technology found inside and a prominent SLP logo. The TVS2300 feeds into an intercooled intake assembly with a high flow pump and larger coolant reservoir. Fuel injectors maintain the original OEM angle for the most efficient fuel delivery possible, improving atomization and combustion. Since the 5th Gen Camaro comes in many flavors and has undergone some changes since its introduction, there are some applications where proper installation procedure and the parts required will change. 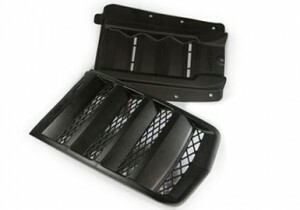 For all 2014 Camaros SLP’s Hood Heat extractor (620032) is required for proper clearance. This Heat extractor retains factory functionality, has a subtle SLP logo and bolts in easily. Installation on automatic transmission Camaros will require GM DOD Plate 12571609, some vehicles will already have this installed, and others may not. There isn’t a lot of information on which cars were built with this plate, the only reliable way to identify which DOD plate your car has is to remove the intake assembly and make a visual inspection. If the DOD plate on your vehicle has 4 raised surfaces you will need to replace it. The correct plate can be purchased directly through SLP HERE.